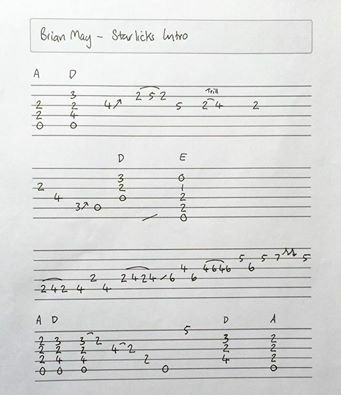 In the early 1980’s Brian May of Queen made a guitar tutorial video called Star Licks. It included a small guitar tab booklet to go with the video. Unfortunately the introduction guitar part of the video was never tabbed of explained. In the above video James Rundle of Rock Licks Guitar Tuition in South Shields has made a tutorial video explaining how to play it. During the Freddie Mercury Tribute Concert at Wembley Stadium in 1992, this was the third song of the second half, performed by Zucchero and Queen. In Queen + Paul Rodgers Rock The Cosmos-tour 2008 it was played in the Spanish speaking countries, sung by Brian. From the 1977 Queen album News Of The World. “Who Needs You” was a song written by Deacon, who, along with May, plays Spanish guitar. Mercury’s lead vocal is entirely panned on the right audio channel while the lead guitar is on the left channel. May also plays maracas and Mercury plays a cowbell. In this video we rest the red special and use a nylon strung guitar. On the record there is more than one guitar and even electric guitar in parts. This video looks at a way of playing the track on one acoustic guitar. Had a quick try out of the Mini May guitar. A small version of the Brian May Red Special guitar. Ideal for kids.